Brylee went with her ball park BFF Riley G to Build A Bear for her birthday tonight! She was super excited b.c she got to ride the bus home to her house and then they went to the mall and had all kinds of birthday fun! She came home with this precious little jewel! 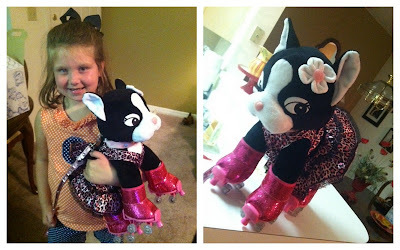 How cute is this little puppy complete with roller skate boots, leash, and a fancy little outfit??? Sally is a doll for sure!! !